World-renowned pollster George Barna has the numbers, and they indicate a revolution is already taking place within the Church - one that will impact every believer in America. Committed, born-again Christians are exiting the established church in massive numbers. Why are they leaving? Where are they going? And what does this mean for the future of the Church? Using years' worth of research data, and adhering to an unwavering biblical perspective, Barna predicts how this revolution will impact the organized church, how Christ's body of believers should react, and how individuals who are considering leaving (or those who have already left) can respond. For leaders working for positive change in the church and for believers struggling to find a spiritual community and worship experience that resonates, Revolution is here. Are you ready? ©2005 George Barna (P)2005 Tyndale House Publishers, Inc. This is a book worth taking the time to read. If you had the nagging feeling of "is this all there is to the Christian walk?" You sit in a Pew each week, tithe, wonder why you're not growing in your faith, told to get on board with the latest building project "since all churches do it", questioning "how many poor people could this money feed?" then this book might just hold the key. As the book says: We are called to "be" the church, not "in" church. It just may rock your world for the better. This is a great example how God moves people, which is very different than man made movements. 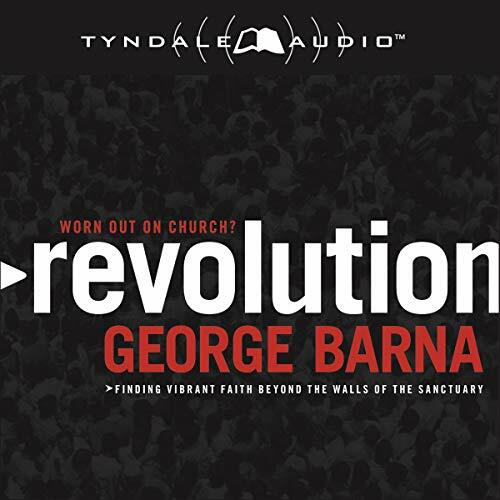 I see God in this revolution, and Barna does a great job of not overly criticizing all that is wrong within the traditional church, but more I felt him showing a different, albeit a better way to help disciple Christians. Yes he does point out many of the churches errors, but does so in a way to teach why this revolution can do what the traditional church is failing to do. I felt his presentation was well balanced and in the end got me excited to see God moving Christians maybe in a way I have never experienced in my 50+ years of being a Christian. I am eager to see where God takes Christians who are fully surrendered to him.